“Quantum Wealth” is an optional one day workshop conducted before our Florida / Ecuador and North Carolina / Ecuador split tours. In a moment learn how to gain extra savings by enrolling before December 11. First learn about some of the benefits of everlasting, quantum wealth. A reader recently sent this note: Hi, Can you please email me some description of the Quantum Wealth for the Feb. conference in Florida? Thanks. Here is my reply: Quantum wealth is wealth attained continuously, effortlessly, in a fulfilling, enjoyable and positive way. We have been incorporating the ideas of Quantum Health and Quantum Wealth into our courses and seminars for more than a decade… but our February 2010 Florida / Ecuador and North Carolina / Ecuador split sessions has make it possible for us to create an entire workshop to help our readers. The “Quantum Wealth” workshop is free to delegates of our seminars and tours. Delegates enjoy coming to our home during the “Quantum Wealth – International Business & Investing Seminars” Here is a group at our North Carolina home. Logic with intuition. The benefit is better adaptation to change. Desire with action. The benefit is more enjoyment. 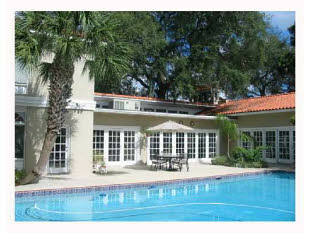 our new Florida home. Save more by enrolling before December 11, 2010. I’ll explain how and why in a moment. First more on how super thinking creates quantum wealth. Bringing delegates to our home for a home cooked meal is an example of a Quantum wealth benefit. This is is fun. Yet there is more. This process helps delegates see the authentic reality of the ideas we share. I have never heard of other seminars offering this… an integration of what we speak about and what the ideas we share achieve. Here are the 21 main points we cover in our one day Quantum Wealth workshop that you can attend free when you enroll in our of our seminars or tours. #1: Quantum mechanics & frequency how they all connect. #2: Three aspects of being – air – fire – water… how to balance and integrate them. #4: The Andean – Indian Connection. How Ayurved and Andean relate. Three fundamentals of longevity. Eat right, work hard and sleep well. Nutrition, exercise and purpose. #5: How dis-ease develops and is stopped. #6: Nutritional goals: Improve digestion, avoid dis-ease here first. #7: How to use cleansings. Melon, pineapple, apples-grapes, vareshna, chelating, cinnamon-sweet pepper tea, steam and mists. #8: Teas. How and when to use cedron, chamomile, lemon verbena, peppermint. #9: Relaxers. How to use chamomile, valerian, lettuce and milk, hot water, vata press. #10: Fire reducers. How to use peppermint tea, aloe, cream massage, frozen grapes. #11: Water reducers. How to use cinnamon tea, paprika, cloves, ginger, ginger-black salt and lemon juice. #12: The power of ritual & routine. When to eat, think, exercise. #13: How to spot imbalances. Moods, physical signs. pulse testing. #14: Quantum leap. How energy, colors, organs, glands work together and change every seven years. #15: Shamanic exercises-yoga, llama walk, lizard, sun salute, crab and mouth release, ring chew, etc. #17: How to use the senses, taste, six flavors. #18: How to use color. #19; How to use sound. #20: How to use exercise. #21: How to use essential oils. This optional, free Quantum Wealth workshop shows how to apply the intelligence to business, investing and lifestyle. We have blended this method of gaining increased intelligence and super thinking into our Super Thinking + Spanish for many years but now have added this to our international investing and business seminars to create quantum wealth. There are at least three simple ways to turn on this super thinking ability: meditation, listening to 60 cycle music and taking Theanine. These three steps integrate four categories of brainwaves, ranging from beta waves, the fastest of the four different brainwaves to alpha, theta and the final brainwave state, delta. Delta brainwaves are of the greatest amplitude and slowest frequency. Deep dreamless sleep takes you down to the lowest frequency. When we allow these waves to interconnect freely we gain unimaginable intellect. Merri and I meditate twice every day to tap into this energy. Plus we listen to 60 beat ten cycle classical music as we work. You could count the number of times we have missed our meditation routine in the last 20 years on one hand. This helps us enormously. This type of music, along with deep breathing exercises for relaxation moves the mind into Alpha and deeper states as well. Health benefits are gained as blood pressure can drop, heart rates slow and the mind becomes calmed. This is a simple as listening to relaxing Baroque music such as Handel’s Water Music. A few others compositions at this cycle include Corelli’s Concerti Grossi, Op. 6, Violin and Orchestra in No. 2, 8, 5, 9. or J.S. Bach’s Fantasy in C Minor and Trio in D minor or Vivaldi’s Five Concertos for Flute and Chamber Orchestra. Music has been used for centuries to induce states…babies being lullabyed to sleep, sea chanteys and harvesting songs to ease workers while laboring. Eastern mystics and South American shaman have used music to carry them to unusual states of consciousness. Your body relaxes and your mind becomes alert in these simple forms of relaxation. The Soviet psychologist, I.K. Platonov, found it was possible to just use a metronome beating at 60 to enable the mind to take in and hold more strongly. In choosing a recording of a slow movement, simply check that the tempo is about 60 beats a minute. When a composer writes a piece of music, he indicates the speed at which he wants each of the different movements or segments to be played. These indications of tempo are generally given in Italian. You will often see them on the different movements of a concerto. For instance, allegro indicates a tempo of around 120 – 168 beats to the minute, andante around 76-108, adagio from around 66 to 76, larghetto 60 to 66 and largo 40-60 beats to the minute. Some performers and conductors may set a tempo somewhat faster or slower than what the composer indicated. To check out the tempo of a recording, be sure it’s at around 60 beats a minute. You can check it with a metronome or against a clock with a second hand. It’s LARGO that we are striving for. Here is a portion of the music list provided with that study. Bach, J.S. : Largo from Concerto in G Minor for Flute and Strings. Bach and Telemann Flute Concerts and Aria to The Goldberg Variations. Corelli, A.: Sarabanda (largo) from Concerto #7 in D Minor. Handel, G.F.: Largo from Concerto #1 in F. Music from the Royal Fireworks. Telemann, G.: Largo from Double Fantasia in G Major for Harpsichord. A third avenue that helps enhance intelligence is Theanine (chemical name: r-glutamylethylamide) one of the chemicals found in green tea. Theanine is used to reduce stress and anxiety without the tranquilizing effects found in many other calming agents. Scientific evidence shows that Theanine stimulates the brain’s production of alpha waves, making the user feel relaxed but alert and not drowsy. It also helps the body produce other calming amino acids, such as dopamine, GABA, and tryptophan. As might be expected from a calming supplement, Theanine may be able to lower elevated blood pressure as well. Our Quantum Wealth workshop looks at how to use super thinking to tap into deeper intelligence and what to do with this intelligence in business, investing and life. This course changes the way a person thinks and learns forever. Then Merri and I along with Thomas Fischer of Jyske Global Asset Management conduct our three day International Business and Investing Course. See more details of this International Investing & Business course here. Here are three ways to attend our February tours. Choice #1: Save the most! Attend everything. 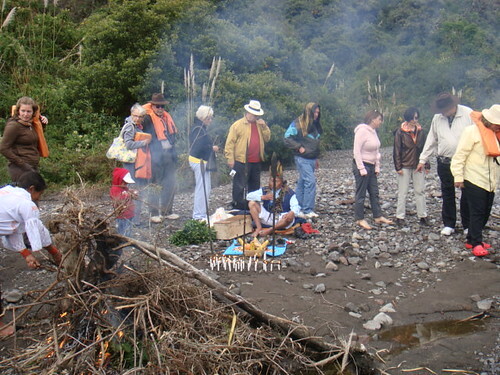 Quantum Wealth… International Business & Investing and all four Ecuador real estate tours. See more on the multi course tours here. Choice #2: Attend Quantum Wealth and International Business & Investing. 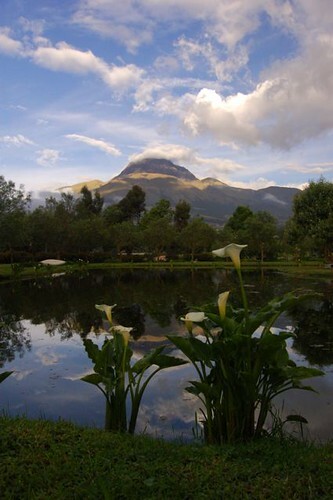 Choice #3: Attend just one, two or three Ecuador real estate tours. Enjoy our split courses. Spend four days with Merri and me learning Quantum Wealth and International Business & Investing Made EZ. 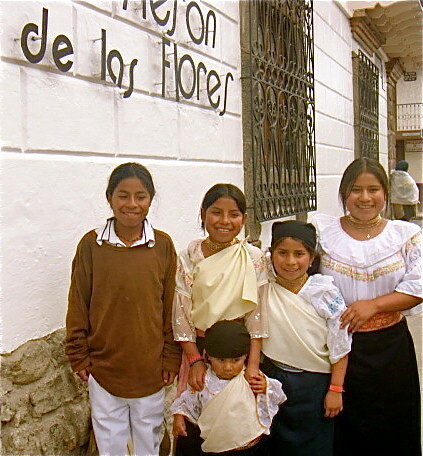 Then travel with our group to Ecuador (& save on our group air fares). 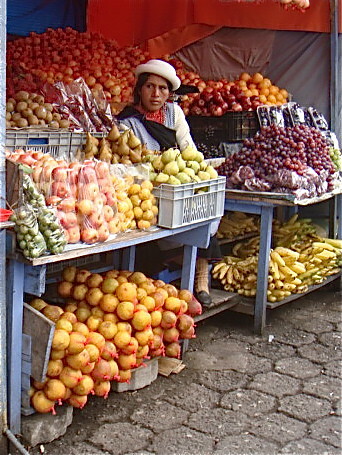 On the Imbabura Ecuador real estate tour there is a visit to food markets… another to Otavalo the largest native crafts market in in the world. 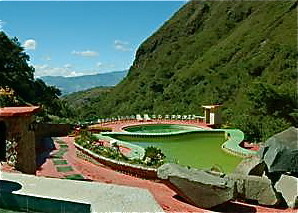 Another day Chachimbiro hot springs is enjoyed . 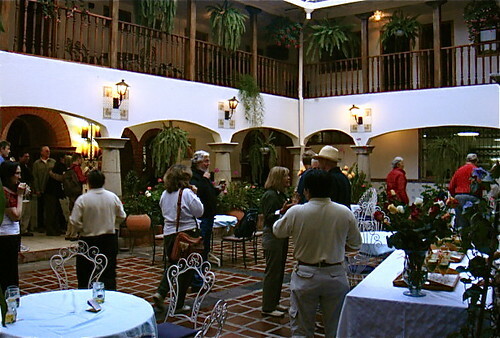 Delegates stay in the colonial Meson de las Flores Inn next door to the Museum of Cotacachi where the course is conducted. Here are delegates enjoying a coffee break at Meson. The Ecuador hotel stay can be as little as $59 night (per room) and tax (including a magnificent breakfast)! 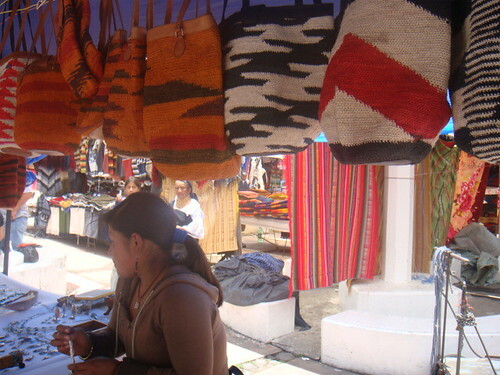 Another day provides a visit to the leather market of Cotacachi, the village of the weavers. There are also visits to shamans. 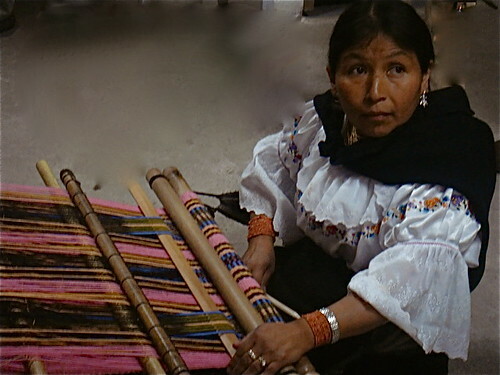 Delegates at a shamanic ceremony. Finally this learning course helps eliminate the suffering of poverty. Gary and Merri Scott, along with Dr Joe Spano and Joe Cox donated hotel Meson de las Flores to the Land of the Sun Foundation which helps the poor. Here are two of the many homeless that are fed daily at the hotel. 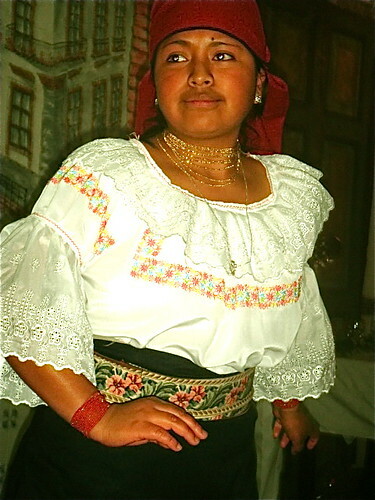 Land of the Sun also provide scholarships to educate Ecuador children like this. We hope you will join us in Florida and Ecuador, the Land of the sun. 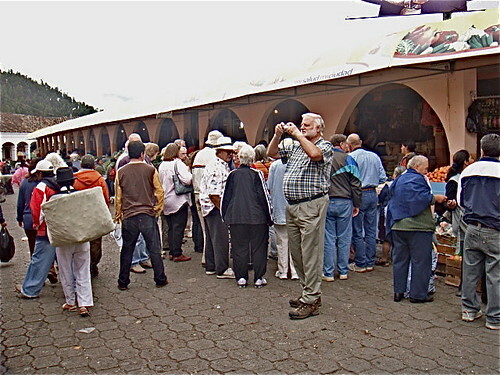 All group travel by coach travel to and from Quito plus during the course. 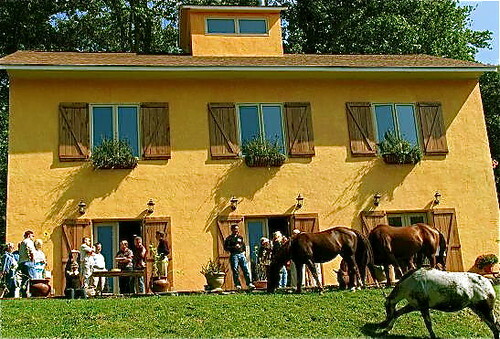 Private travel, accommodations and food are not included. Join us for our first split session in 2010. Here are what a few people say about our courses.